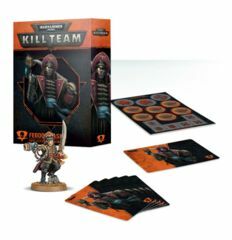 Kill Team: Gaius Acastian Deathwatch Commander Set (102-40-60) Kill Team Ready! Kill Team: Krogskul's Boyz Kill Team Ready! Kill Team: Feodor Lasko Astra Militarum Commander Set Kill Team Ready! Kill Team: Ankra the Colossus Necron Commander Set Kill Team Ready! Kill Team: Gitzog Wurldkilla Ork Commander Set Kill Team Ready! Kill Team: Fireblade Twinflame T’au Empire Commander Set Kill Team Ready! Kill Team: Vysa Kharavyxis Drukhari Commander Set Kill Team Ready!